Quesadillas are a great household staple for dinner. Not only are they simple to pull together in a hurry, but it's one of our favorite ways to use up all kinds of leftovers, from taco meat to cooked chicken and vegetables, just add those bits and pieces of cheese lying around in the fridge and voila! These quesadillas were born from some leftover pesto that we made to toss with pasta, some leftover corn tortillas, and some leftover browned turkey from making tacos. You can use this as a template for creating your own leftover-inspired quesadillas. Make sure the heat is fairly high so that the corn tortillas get nicely browned and a bit crisp. This, plus a salad, is a great lunch or dinner. Place the sun dried tomatoes, basil, and garlic in a food processor and pulse to combine. Add the salt and pepper and the cup olive oil and puree until it forms a paste. Heat a large heavy skillet, such as cast iron, over medium-high heat and add 1/2 teaspoon of the oil. Spread some pesto over the one side of the corn tortillas (about 1/2 teaspoon on each) and place a tortilla pesto-side up in the pan. Sprinkle 1/4 cup cheese over each of the pesto sides, then sprinkle a couple of tablespoons of the browned meat on top of that. Place the other tortilla on top. 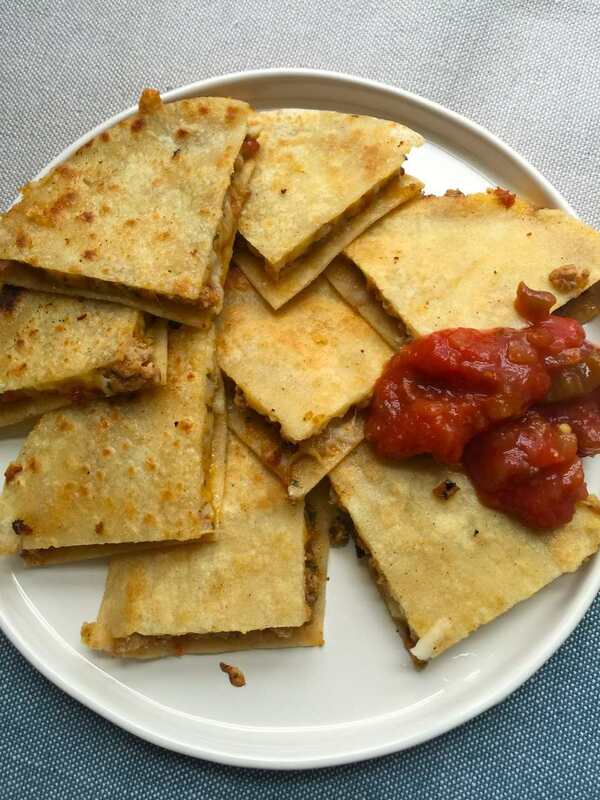 Cook for 2 to 3 minutes, until the bottom of the quesadilla is nicely browned and a bit crisp, then use a wide spatula to slip the quesadilla and cook for 2 to 3 minutes on the other side, until the bottom is also nicely browned. Transfer to a cutting board, and cut into quarters. Repeat with the remaining tortillas and filling (again you will have leftover pesto to use in different ways). Serve hot with salsa and sour cream, if desired.